In conjunction with the Chinese New Year celebration, the best chefs from 8 of the Top Chinese restaurants in Klang Valley will cook up a storm to prepare customized Extravagant 8 menus that will satiate the palate and tantalize the taste buds between 20 January and 17 February 2011 exclusively for Standard Chartered credit card holders. Priced at RM888++ per table of 8 pax, Standard Chartered credit card holders will not only be taken on a gastronomical journey; they will also be treated to free fortune cookies. 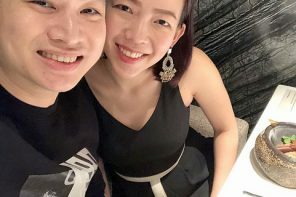 The 8 participating restaurants in this campaign are Li Yen, Ritz Carlton; Shanghai, JW Marriot; Celestial Court, Sheraton Imperial; Tai Zi Heen, Prince Hotel; Zing, Grand Millennium; Gu Yu Tien; Elegant Inn; and last but not least Chynna, Hilton KL. 8 is such an auspicious word to the Chinese. Pronounce as “fa” (發), it signifies fortune and wealth. So let’s usher in the new year with a prosperous feast at Shanghai, JW Marriot. 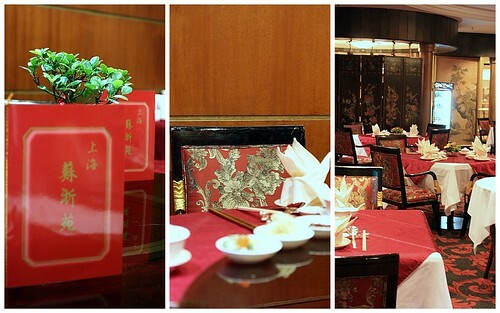 Located on Level 1 of JW Marriott KL, it is the only authentic Shanghainese restaurant in KL. Shanghai’s elegant interior is reminiscent of the stylish city of Shanghai in the 1920’s. It reminds me very much of the TV series “The Bund” (上海灘). While there were no sights of of pretty ladies clad in cheongsams parading against a backdrop of Chinese mafias in suits, we have a bunch of corporate slaves who brave the traffic and make their way for the luscious CNY dinner. The great meal started off with 鸿运大捞生 Salmon Yee Sang. 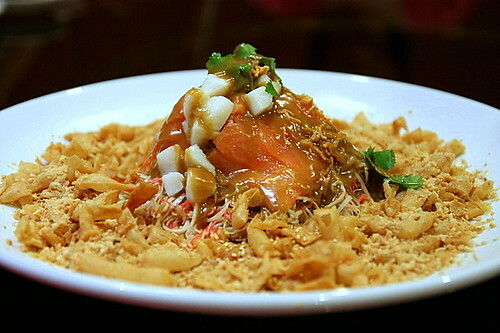 The yee sang, which consists of crispy crackers, salmon sashimis, fresh scallops and grated vegetables was drizzled with a special concoction of mustard sauce, peanut sauce and sweet sour sauce. The crispness of the vegetables and the tangy sauce is so refreshing and appetite-whetting. Toss the colourful salad higher and say Lo Hei at the same time to usher in prosperity and abundance for the year of RABBIT! 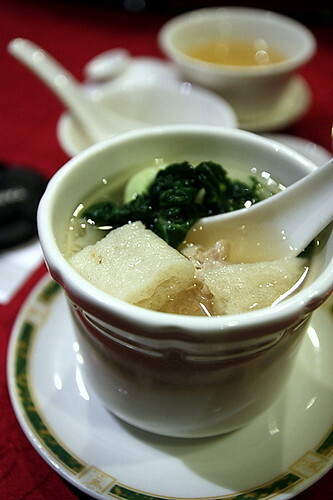 干贝竹笙云吞炖鸡汤 Double-boiled superior wanton soup with dried scallop and bamboo pith. There’s something about Chinese superior soup that makes me feel really comfortable. It could be the nourishing elements; or the thought that it gives me healthy, glowing skin. The double boiled soup was subtly sweet; the bamboo pith had a nice crunch and the wanton was so stuffed with ingredients that it was on the verge of bursting! The grouper fish was sliced in a special way that when deep fried, the batter will transform into a beautiful shape of chrysanthemum flower. 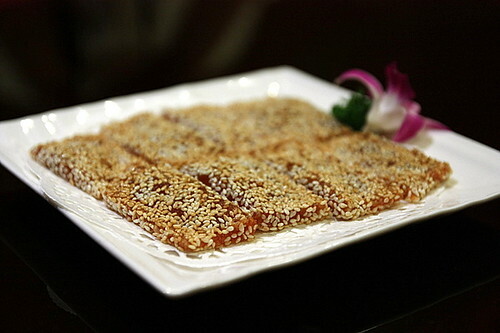 The crispy, non greasy delicious piece of fish is coated with a delicious layer of sweet and sour sauce. Deep-fried goose liver wrapped in bean curd is a very unique dish. 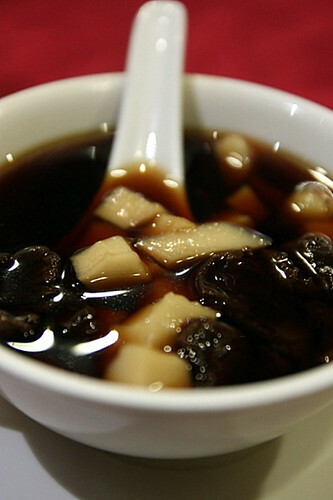 The chef overturned the bean curd, exposing the spongy layer that became really crunchy after deep fried. The goose liver, fully imported from France was really smooth and velvety. Everyone agrees unanimously that this dish looks too pretty to be eaten! According to Chef Wang, the dish underwent a rather tedious preparation process. Layers of pork bellies were slowly braised to achieve tender meat and jelly like consistency of the fat. Then, he sliced the pork bellies carefully and assembled the different layers to form a pagoda. Dig in to reveal the hidden treasure inside the “pagoda” – exquisite bamboo shoots from the mountain of Zhe Jiang province in China. Gorgeous piece of pork belly and absolutely melt-in-your-mouth deliciousness. 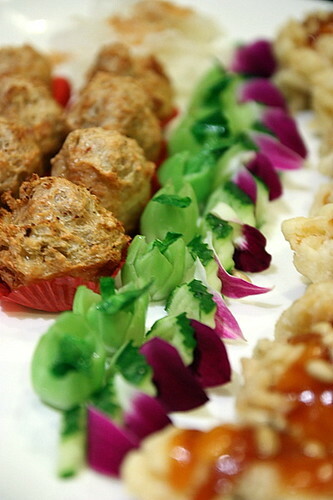 Not a dish that can be prepared easily; credits have to be given to the chef for his exquisite skills and experiences. 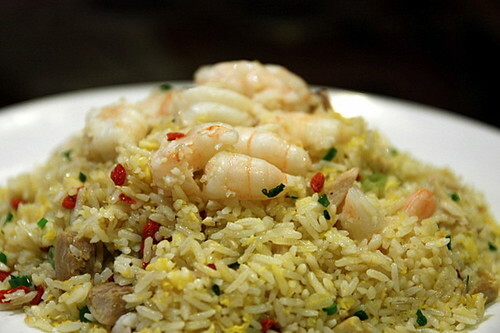 Full of wok hei, the fluffy fried rice was really, really good! SO good that not even a tiny grain was left unattended. 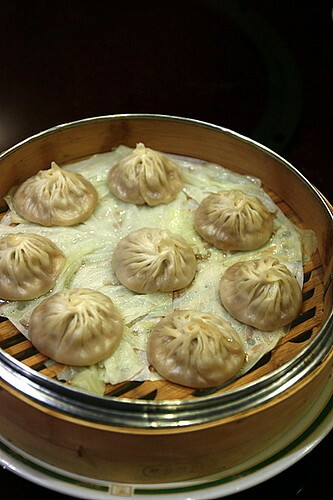 Shanghai takes pride in signature dish – Shanghai Xiao Long Bao. 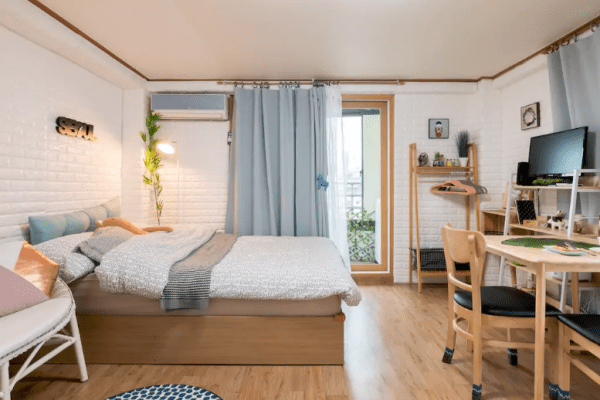 Yrue to its name, it has exhibits the key characteristics of a good xiao long bao – thin skin and juicy innards. Probably my least favorite of the night, bland tasting glutinous rice cake from Shanghai is just not my cup of tea. I love glutinous rice cakes, infused with (lots of) sugar, and all that sinful stuff that you wouldn’t want to know! The crispy outer layer and the gooey sweetness of melted nian gao oozing out was so comforting. What a perfect ending to our amazing meal! So if you are a Standard Chartered holder, you get to enjoy the Extravagant 8 Menu for only RM888+ for a table of 8 pax, additional diner will have to pay RM111+ each. 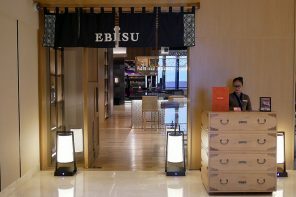 Hurry and make your reservation because the Extravagant 8 Menu is only available for a limited time only – 20th January 2011 until 17th February 2011. 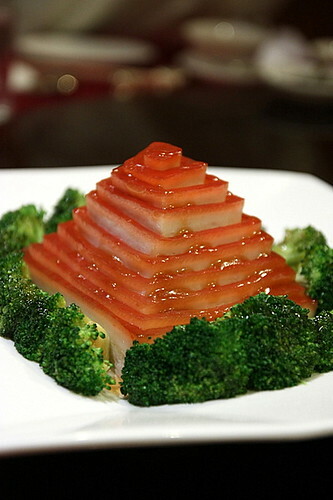 Yup, gotta admire the chef’s tenacity and skills in whipping up that pork pyramid. Just that it took us mere minutes to polish everything off. .-= J2Kfm´s last blog ..Shanghai @ JW Marriott- KL – Stylishly Oriental =-. The pagoda is really an impressive work of art! .-= jason´s last blog ..Shin Chan Ramen- Solaris Mont Kiara =-. .-= thule aka leo´s last blog ..Day 2 – Tanjung Tualang &amp Ipohs Wedding Dinner =-. Love to have a taste of that Braised Pork! everything here looks so pretty! 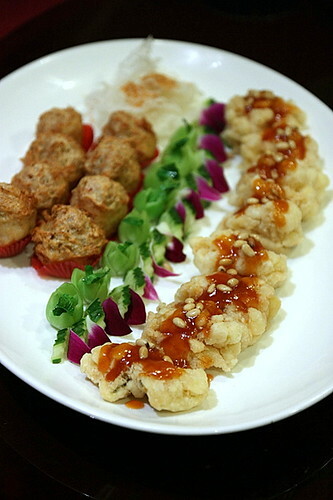 .-= KY´s last blog ..KY eats – Gu Yue Tien’s extravagant 8 menu =-. Had fun that night. 🙂 Good company and good food! 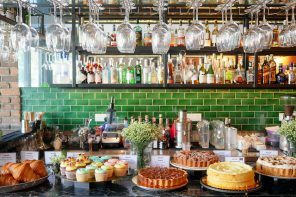 .-= Lyrical Lemongrass´s last blog ..Huck’s Cafe- Jalan Gasing- PJ =-. .-= ai wei´s last blog ..Nagomi Valentine Lovers Bento @ Nagomi Japanese Restaurant なごみ =-. 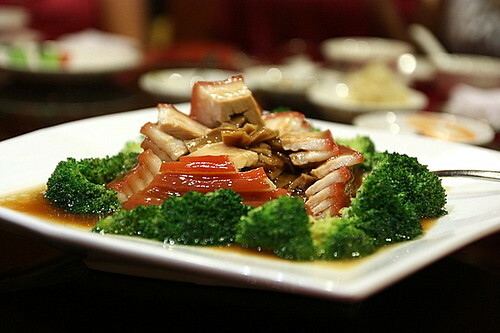 uh uh..Braised Shanghainese pork look like something to die for. .
nice to see , but how about the taste ? I worked before at here, I agree that the food at here are good and delicious.